They were only rookies… Two green cops blown away on the killer walkways of New York. 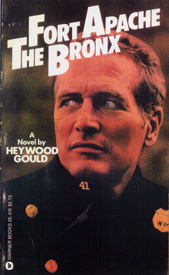 Fort Apache, The Bronx… the 41st Precinct where nobody ever gets a second chance and most don’t even have a first. Now the Force is on the prowl under a tough new captain who is determined to shape up this last command. A command for losers where life is mean and death is often murder and where the law of the jungle is the only law. The film, which opens today at the Criterion and other theaters, is a tough-talking street melodrama, both shocking and sorrowful, acted by Paul Newman and a huge cast with the kind of conviction that can’t be ignored…it’s also entertaining and very moving, which is not something you can say of most movies about the decline and fall of civilizations. One of the reasons the film is so effective is that, right from the start, the audience shares a sense of physical desolation that eventually becomes psychological as well as spiritual.